I believe most of you have a bunch of DVDs, and you may think about copying and creating a digital library for backup. However, due to the DVD copy protection, it can be a tough task to digitize DVD discs and backup your DVDs. Don’t worry! This article will provide you with a straightforward solution to decrypt DVD for backup purpose, which is much simpler than you think. WonderFox DVD Ripper Pro can help you to unencrypt DVDs and convert DVDs to digital videos. It also offers 1:1 quick copy feature that enables to copy DVD to ISO image and DVD folder flawlessly. All features are self-explanatory and easy to use. In fact, all commercial DVDs are encrypted and protected to prevent copyright infringement and illegal distribution. Various digital rights managements (DRM) and encryption systems are employed on commercially produced DVD. The most common copy protections are Content Scramble System (CSS) and Regional-playback Control (RPC) system. What’s more, some DVD releasers and publishers have developed patent copy-protection systems to prevent DVD from illegal copy, such as Sony ARccOS, Disney X-Project DRM, etc. 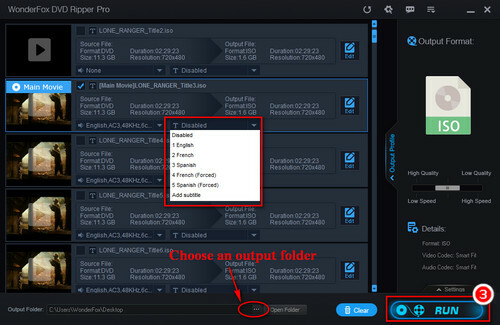 To remove these copy protections for backup, you need a powerful DVD decrypter, and WonderFox DVD Ripper Pro is such a tool that can decrypt dvd and copy DVD to digital video, convert DVD to ISO and DVD folder. You don’t need to learn any complicated process. It’s quite easy to unencrypt DVD with this software. The guide is only for personal DVD backup. It is strictly forbidden to distribute any copy-protected DVD content or use it for commercial purpose. Before start, the DVD decrypter software free downloadfree download here and install it on PC. Insert DVD disc into the DVD-ROM drive of your computer, and then open WonderFox DVD Ripper Pro to unencrypt DVD. Just click on “DVD Disc”, select the needed drive letter, and press “OK”. The software can quick detect, analyze and decrypt DVD, which are almost instantaneous. What’s more, the software will select the main title of a DVD movie. Even if you need to decrypt a TV series DVD, each episode will be marked correctly. Tips. As the picture shows, WonderFox DVD Ripper Pro also supports ISO image and DVD folder inputs. Click on “Output Format” button on the right and choose the needed output format. You can choose to convert DVD to ISO for 1:1 exact copy of the DVD. Just click on the purple “1:1 quick copy” button and choose ISO image profile. 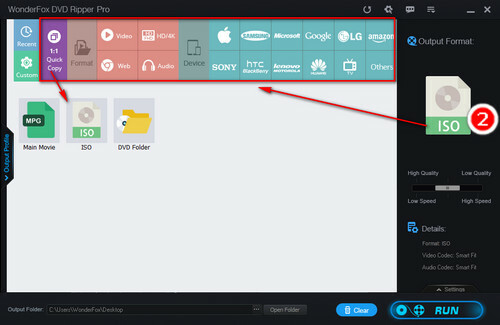 If you want to play DVD on mobile devices, just choose an digital video format under Video tab, such as DVD to MP4, DVD to AVI and DVD to MKV. The ready-made presets for kinds of devices are also given. Just go to Device tab and choose your device model. You’re able to convert DVD to iPhone X, DVD to iPhone 7, DVD to Huawei, etc. Specify the output path by pressing the three dots icon on the bottom. Finally, click on “Run” to complete the process. WonderFox DVD Ripper Pro supports GPU acceleration to unencrypt DVD and copy DVD movies in the fastest way. Tips. WonderFox DVD Ripper Pro allows to add subtitles to DVD. You can even rip DVD with forced subtitles only. WonderFox DVD Ripper Pro is a well-received DVD decryption software favored by users. It can unencrypt and copy any home-made and purchased DVD in quick and easy way. Over 300+ video & audio formats and the optimized presets for kinds of devices are offered. 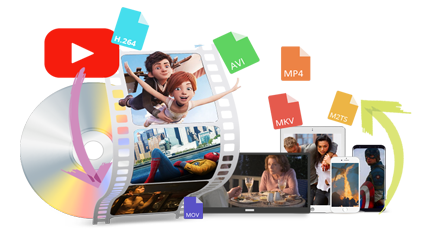 For DVD movie fans, this software is absolutely a good assister for easy viewing and preservation of DVDs. The useful software that enables you to decrypt DVD, convert files to kinds of formats and download video online are available now. Try WonderFox DVD Video Converter, the all-purpose tool that combines video converter, DVD ripper and video downloader into one. It will never let you down.